Welcome, National Speakers Association member. You are a new member of the National Speakers Association, and you’d like to be listed in the member directory? Select one of the 2 options below and you'll be done in 10 minutes. LINK MY EXISTING eSpeakers PROFILE TO THE NSA DIRECTORYI already have an eSpeakers account that I want to link to the NSA member directory. I NEED A NEW eSpeakers ACCOUNTI do not have an eSpeakers account and would like a Basic listing at no charge. If you have questions about your eSpeakers profile, please contact eSpeakers support. The member directory on nsaspeaker.org is powered by technology from eSpeakers. If you don’t already have an eSpeakers account, the NSA will provide you with a Basic level eSpeakers.com account at no charge as part of your NSA membership. 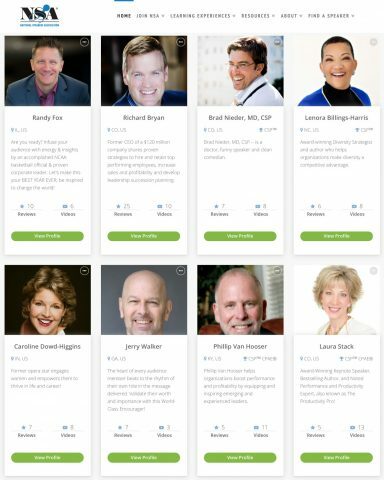 Many professional speakers already have an eSpeakers account. If you do, you can link your existing account to the NSA member directory and do not need to create a second account. Find yourself in the member directory on the National Speakers Association website.